Education of Vishal - B.Sc., in Visual communication, Loyola college. Vishal Krishna born 29 August 1977, is an Indian film actor who has appeared in primarily Tamil language films. Often starring in his home productions, Vishal became an actor after a stint as an assistant director in films. Vishal Krishna was born on 29 August 1977 to G. K. Reddy and Janaki Devi in Andhra Pradesh. His father was a leading film producer for Tamil and Telugu films and his family were settled in Chennai for business purposes. His elder brother, Vikram Krishna now produces several of Vishal's films and had previously appeared as an actor in small budget films under the screen name of Ajay. Vikram is married to Sriya Reddy, who played the love interest of Vishal in his home production, Thimiru. Vishal also has a younger sister, Aishwarya, who is pursuing a degree at college. Vishal obtained his secondary education from Don Bosco Matriculation Higher Secondary School before securing a degree in visual communications from Loyola College, Chennai. He attended Loyola with actor and producer Udhayanidhi Stalin and his wife Kiruthiga, whom Vishal has maintained a close friendship with since his college days. 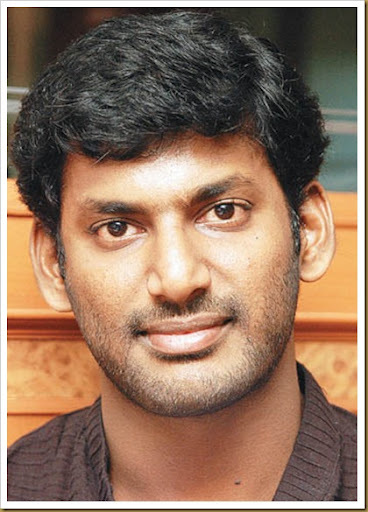 In February 2008, Vishal told the media he was in love with an actress, but refused to name her publicly. Speculation arose that the actress was either of his co-stars, Priyamani or Nayantara.Priyamani almost immediately told the media that the actress was not her whilst Nayantara also soon went on record and denied the links.Reemma Sen and Trisha Krishnan was also speculated thereafter, which Vishal went on to deny. After completing his degree in Visual Communication at Loyola College, Vishal was able to secure an apprenticeship with noted film-maker Ram Gopal Varma but his parents refused and wanted him to work in South Indian films. Vishal subsequently went on to assist actor-director Arjun in his ventures Vedham and Ezhumalai. Whilst on the sets of Arjun film, a producer spotted Vishal on the sets and signed him to appear in Gandhi Krishna's directorial debut, Chellamae. Accepting the role, Vishal prepared by joining Koothu-P-Pattarai to hone his acting skills and played the protagonist role of Raghunandan whose wife, played by Reemma Sen is kidnapped by her childhood friend, portrayed by Bharath. The film opened to rave reviews and subsequently went on to become a commercial success, but Vishal's performance was overshadowed by Reemma Sen's and Bharath's with a critic claiming his performance is "apt" but "there was plenty left to hone". His next film was Sandakozhi with Linguswamy who had previously worked with his father's production house as an assistant director. The action film co-starring Meera Jasmine and Rajkiran, upon release became a blockbuster and its Telugu dubbing also created an impact. The film also gained critical acclaim and Vishal was described to have "improved from his Chellamay days" and "clicked as an action hero". The success of Sandakozhi saw further opportunities arise for Vishal, with film journalists claiming that he was "the fastest rising action hero" of the time. After a cameo as himself in Sai's Dishyum, he went on to appear alongside Reemma Sen for the second time and Sriya Reddy in Tarun Gopi's action film, Thimiru. The film opened to mixed reviews with Vishal being praised for his intense performance with a critic claiming his performance "is the film's only strength and, to an extent, making up for the weak script and poor characterisation". His next film, the political drama Sivappathigaram directed by Karu Pazhaniappan and featuring Mamta Mohandas and Raghuvaran became a failure financially despite favourable reviews.His next released in January 2008, Hari's multi-starring family drama Thaamirabharani and the film went on to gain considerable box-office success, carrying good reports amidst other big budget releases.Later in the year he appeared Boopathy Pandian's Malaikottai, a comedy entertainer starring Priyamani. In his first full-length comic role, Vishal received mixed feedback for his portrayal from critics, with Rediff stating that he is "a far cry from the rather endearing young man in Sandakozhi", whilst describing his performance as "cringeable", but another critic cited that he had utilised the opportunity well.Despite mixed reviews, the film took a large opening and became another big success for Vishal. His following two releases, however, Sathyam and Thoranai, his only releases in 2008 and 2009, respectively, failed to do well at the box office. Vishal will next appear in a leading role in noted filmmaker, Bala's Avan Ivan alongside Arya. During production, the film has gained Vishal acclaim for his change of image, with his portrayal as a squint being expected to gain him acclaim post-release. 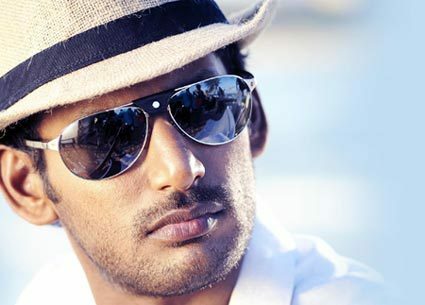 During the shoot of the film, Vishal suffered from severe eye pain and headaches whilst he also suffered a serious muscular injury on sets.Furthermore Vishal has signed up to play the role of a police officer in two other films simultaneously. The first being Pattathu Yaanai, in which he recombines with Boopathy Pandian; the second being an untitled home production directed by Prabhu Deva and featuring Sameera Reddy in the lead role. Vishal and Vijay have huge following in Andhra Pradesh through their dubbed Tamil films. All their Tamil films are invariably dubbed in Telugu unless the Tamil film happens to be a remake of a Telugu film. "The directors made sure that they prepared the scripts that suited my body language. As an actor I had a steady growth. My first film was a romantic film. The second one is action film." "I never thought my movie will do this well here. Earlier, my flicks were dubbed in Telugu from Tamil. But it was my dad's dream that I act in a Telugu film since we are from Andhra Pradesh. Bilinguals seem to be the perfect success-formula for me. From Salute to Pistha, all my movies have been great hits here,"
"I believe this is the first time for an actor to perform squint-eye throughout a film. We are in the process of applying to the Guinness Book of Records," . "I am already enjoying the fact that my films are doing well in both the states. But now, I have plans of expanding my Telugu career by working with Telugu directors as Tollywood is one of the biggest industries,"
"I was so inspired after watching Ram Gopal Varma's film Shiva that I contacted him. I even managed to bag an apprenticeship with him. But my mom didn't allow me to leave home and fly to Mumbai. Then eventually, I got an acting offer. If I had taken up RGV's offer, I would have been a director by now,"
vishal affair with Priyamani .They could be seen spending long time together and used to chat a lot. He's so hot! He makes me so horny! wow!! !